A group of Monash University students has taken the checkered flag at the international Formula Student (FS) competition for their combustion engine racing car. 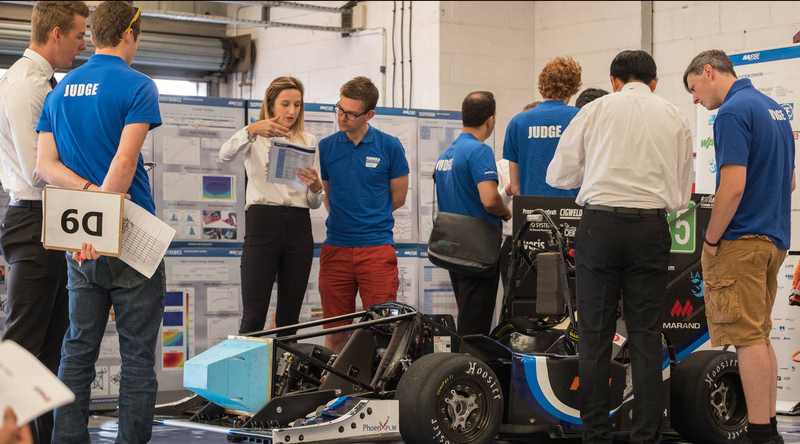 More than 3000 students from 129 teams representing more than 30 countries took part in this year’s competition, run by the Institute of Mechanical Engineers (IMechE). The goal is to create and test drive a prototype single-seat racing car. It judges entrants not just on the design of a race car, but also the engineering practices and team management. Monash Motorsport, from Monash University in Melbourne, won first place overall with the M17-C (combustion) vehicle, with high marks for its engineering design, endurance and overall dynamics. The team’s M17-E (electric) car also received high marks, placing third overall. The team comprises just over 100 students, but only about 40 made the trip to the UK for last weekend’s competition. The rest remained in Melbourne to continue working on the cars that will be used in the FS Australia competition later this year. The combustion and electric cars share many of the same features: the same tyres, suspension, chassis and aerodynamics. The only difference between the two are the combustion car has a 690cc KTM single-cylinder engine, and the electric car has an 80kW electric motor and a lithium polymer battery pack. Designing the two cars to be as similar as possible was a strategic move, said Scott Wordley, Monash Motorsport’s faculty advisor and a senior lecturer of mechanical design at Monash University. “Maybe about 70 per cent of the cars are identical, and that was an intentional strategy. We had to be able to design them efficiently and also build them in a very compressed timeline to allow sufficient testing,” he told create. In previous years, the team has used novel additive manufacturing techniques such as 3D printed titanium for the suspension components, but this year decided to move back to more conventional manufacturing, like CNC machining and fabrication to ensure that both cars were finished on time. But according to Wordley, what really set Monash Motorsport’s cars apart from the competition was the amount of testing they went through. “We’re big believers in the value of developing the car and the drivers to be able to get the most out of the vehicle,” he said. In that year, the electric and combustion cars were put through their paces with test drive after test drive. To improve the aerodynamics, the team made use of the university’s full-scale wind tunnel. “We also invest a lot of time and effort taking measurements and logging the performance of our vehicles on the track to ensure we’re getting the best performance out of them. We also spend a lot of time developing the drivers and comparing data between the drivers to figure out where they can improve so we have consistently high performance across the driving team,” Wordley said. For the first time in the UK competition’s 20-year history, there was an all-women crew: Team AUJ from the National University of Sciences and Technology in Pakistan. About 13 per cent of students participating in the FS competition this year were women. Autonomous car technology also made its debut. FS-AI tasked some teams with developing a cost-effective software package that would allow an autonomous car to make its own decisions and ‘learn’ over time to optimise its performance on the course. According to the competition organisers, this new addition is aimed at addressing a skills gap – a shortage of engineers capable of integrating electronics, software and systems engineering to get driverless car technology on the road. Monash Motorsport has also been toiling way for nine months on a third car that will participate in the driverless competition in 2020. It’s based on their electric car design, but equipped with a suite of sensors to help it navigate, including: LIDARs; stereo cameras; differential GPS systems; and a NVIDIA graphical processing unit (GPU), which allows it to do a high number of calculations, process the data, fuse it together and plan its path. 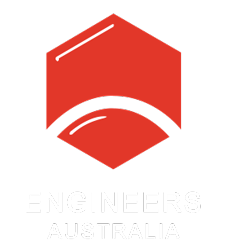 The Australian Driverless Vehicle Initiative (ADVI), which represents organisations working on driverless technology, estimates developing autonomous cars will create more than 16,000 jobs and $95 billion in value for the Australian economy. 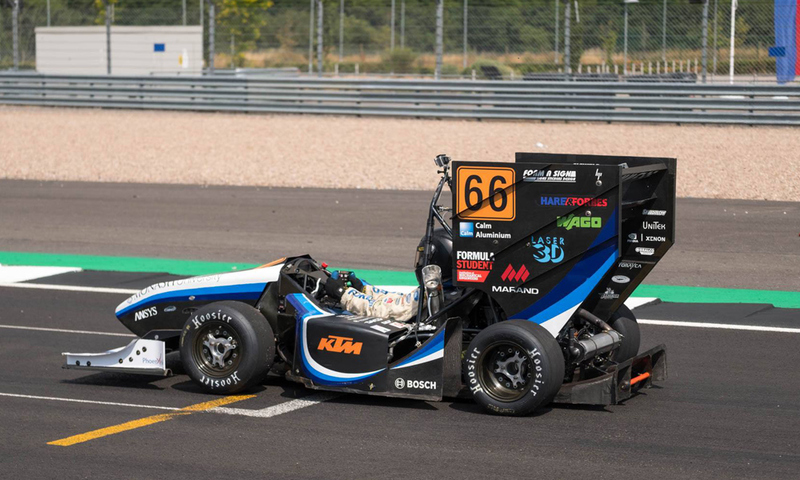 The UK Formula Student competition was just one pit stop for Monash Motorsport on the European competition circuit. From the UK, it’s on to Austria and Germany to round out the European Formula Student competitions. They always hope for wins and podium placements, but Wordley said just seeing the students get into it is really rewarding. “We don’t get a lot of opportunities within our coursework to allow students to do such extended, integrated design projects, so this really challenges their project management abilities and forces them to confront very real limitations of like time, money and manpower,” he said.